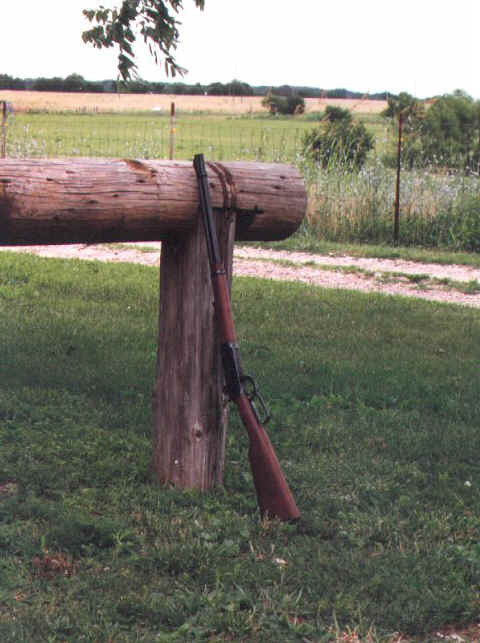 Since its inception, the Model 1894 Winchester has enjoyed wide acceptance with the shooting public. Hailed in its day as a flat-shooting, high velocity rifle, the '94 and its famous cartridge, the .30 WCF (more popularly known as a "thutty-thutty" in my part of the country) packed a lot of punch into a small package. And as originally loaded with a 165 gr. softpoint bullet at an advertised velocity of 1970 fps, it was a high velocity round, especially when compared to most of the other caliber's available at the time. While it was produced in .32 Special (and in other calibers these last few years) the Model 94 is best known in .30 WCF (.30-30 Winchester) caliber. And when someone says, "30-30" it's usually the Model 94 that comes to mind, even though many other guns including bolt action rifles, single shot rifles, and several types of handguns have been made in this caliber. 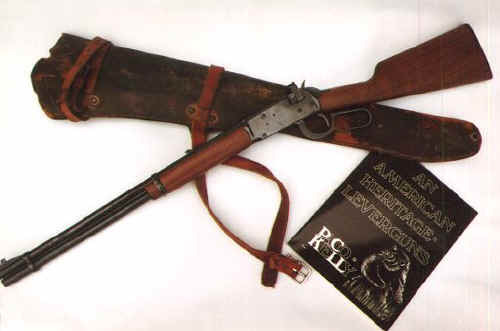 Nevertheless, the Winchester 1894 is probably the best known. The rifle itself is a classic. Norm Flayderman (FLAYDERMAN'S GUIDE TO ANTIQUE FIREARMS AND THEIR VALUES ) said it was "....a specimen of ultimate perfection in a lever action rifle..." (page 263) It does have appeal, for since it's introduction over 103 years ago there have been millions produced. I spoke with Becky Costello at U.S. Repeating Arms who told me their records indicate over 7 million Model 94's had rolled out of the Winchester plant. When you add that number to all the Marlin and Mossberg leverguns, plus all the single shot and bolt-action rifles in this caliber, there are a lot of .30-30's out there somewhere. I have long known the .30-30 as a great rifle, being raised by my Dad to believe that it was a good hunting gun (contrary to some today). He never told me it was a "short-ranged, underpowered brush gun". In fact he raised me to believe just the opposite. Back in the 1980's I guided him on a Mule Deer hunt. 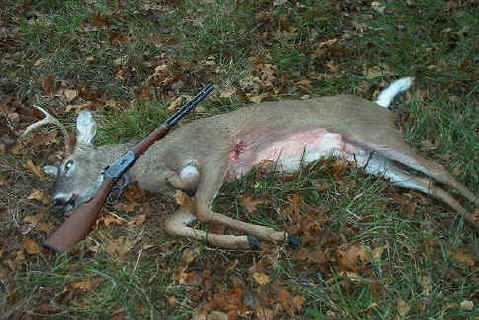 He was using his old worn Marlin 336 with handloads concocted between him and Paco. We climbed over the mountains and up into a ridge overlooking a valley where the Mule Deer loved to feed. Sure enough, there was a herd of about 25 or 30 feeding in that little valley. We made a stand on the top of the ridge and Dad got set up. Watching the deer we could see they were feeding slowly in our direction. then, after 15 minutes or so they began to move off toward the North and I told Dad, "You better take one. They are moving away from us." He asked which one he should shoot, since I had the binoculars trained on the deer. I told him the one directly in front of him by the large outcropping. Dad looked through the receiver sight, squeezed the trigger and I saw the deer stand up on it's hind legs and fall over backwards, then heard a flat "WHOP" of the bullet strike. I told him, "Now shoot the one underneath that one!" Dad levered in another shell, looked through the sights and fired again. That deer took 3 or 4 hops and collapsed. Two shots - Two deer down .. and the distance was well over 200 yards. That's some work for a "short-range brush gun"! Just for fun I chronographed some factory loads out of the Model 94 for comparison to what the factories list their loads at. None reached their advertised velocity, though to be fair, most factory listings are computed out of a test barrel. And velocities do vary a quite a bit between firearms. One thing I know for sure, no matter the velocity, most of these loads work! And in the end that is what counts. Groups fired with Factory loads from Model 94 Winchester, using a rolled-up carpet on the hood of my 4WD for a rest, all with open sights. All are 3-shot groups. The smallest group recorded at 110 yards was with the Winchester 170 gr. Silvertip: 1.25"
I also fired some of the Factory loads through the leg bones of a 940 pound steer we had recently butchered. I set the leg bones on a stump with 8 layers of carpet behind the bones and a 2" thick solid oak door as a backstop. I wanted to see what the bullets looked like after going through the bones and carpet but before they hit the door so I added a piece of cardboard between the carpet and the door. All loads went through the leg bones, carpeting and into the door. The 125 gr. Federal JHP literally blew the bones to pieces with chunks raining down in the yard, landing up to 20 feet away. The best penetrators were the 170 gr. Winchester Silvertip and the Federal 170 gr. 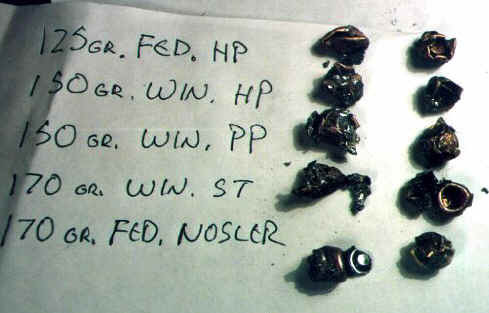 Nosler Partition loadings. Very interesting was the fact that neither one of the heavyweights retained the most weight after going through everything. The 150 gr. Winchester Power Point retained the most weight and came in a close 3rd in penetration. By the time I received the Speer Nitrex 150 gr. loadings the bones were long gone. However I did some limited testing against 150 gr. loadings from other manufacturers and found the new Speer load to hold up well. From what little testing I did I would say the Nitrex bullet will hold together pretty well. Accuracy is on par with the others. 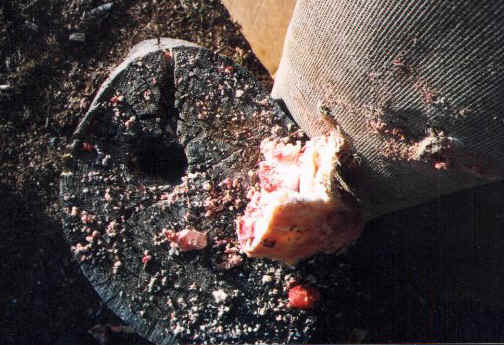 Bullets fired from 15 feet through the leg bones of a 940-pound steer, through 8 layers of carpet, into a solid oak door. All bullet depths measured to the base of the bullet in the door. 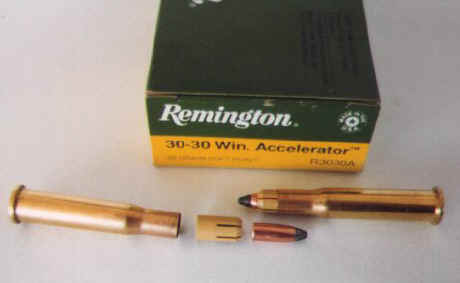 During the testing of the Factory loads we fired some of the lightweight loadings including the Remington Accelerator. This is a .22 caliber 55 gr. 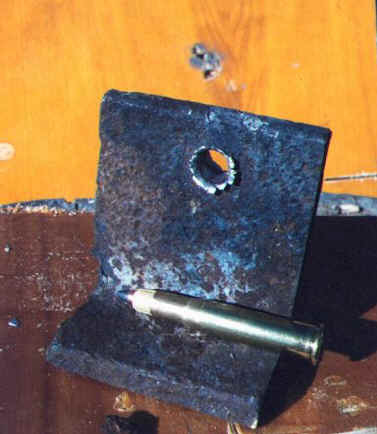 bullet in a plastic sabot. Advertised at 3400 fps, this load ran somewhat over 3200 fps out of my gun. It was hot enough to punch a nice clean hole in a piece of 3/8" steel. While they were interesting I did not do much else with them. I think they might be useful for the person who has only one rifle and wants to expand the use of it to blowing holes in coyotes or other varmints. I know they work on smaller animals for I once guided a friend's wife on a Javelina hunt. She used an old Model 94 Winchester and the Remington Accelerator loads to take a nice Javelina from about 100 yards. It worked just fine, creating massive internal damage in the chest cavity. Handloading ammunition for the Model 94 lever action rifle requires some special consideration. For example, shells should be full-length sized before reloading. This is due in part to the fact that the lever action does not have the "camming" power of a bolt action rifle. In a bolt action you can quite often simply size the neck of the cartridge. But for good functioning the cartridges used in the levergun should be full-length sized. Overall though, the grand old .30-30 lends itself to reloading very nicely. Designed in an era that did not demand thick case walls, with a nicely sloping shoulder and easily sized neck, the .30-30 Winchester cartridge is one of the better rifle cartridges for the shooter who likes to reload. Loading dies are readily available from all the major manufacturers in either 2-die or 3-die sets. The 2-die set performs the depriming, sizing and neck-expanding in one die, while the 3-die sets have a separate neck expanding die requiring one extra step in the reloading process. The 3-die sets are preferable if you are reloading cast bullets, while with jacketed bullets either type of dies will work well. 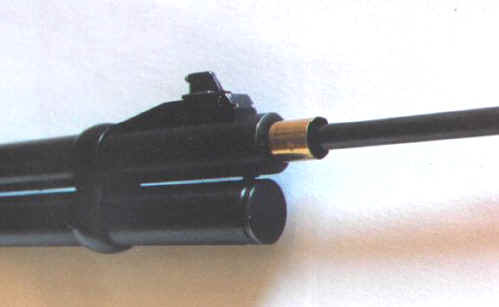 The magazine on the levergun requires the use of flat-nose bullets. (Yes, there are some round-nose bullets in use. These usually have a generous round nose.) The nose of each bullet rests smack against the primer of the cartridge in front of it in the magazine. 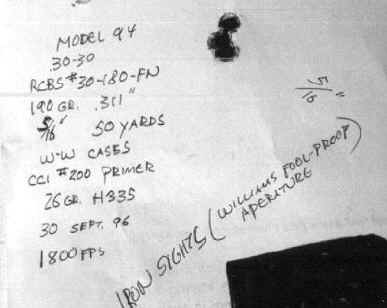 With spitzer (pointed-nose) bullets, recoil is said to set off the cartridges in the magazine, creating a serious hazard to whoever is holding the firearm. Whether the gun recoils enough to do this is argued among some devotees of the levergun. If you work the lever to feed a shell into the chamber you will notice that the shells in the magazine jump rearward rather violently. Some feel this is what has been responsible for magazine blowups. Whatever reason it may be, the use of blunt bullets is a must. Another distinctive feature is that the bullets should be crimped in cartridges intended for lever action rifles. This is due mainly to the magazine arrangement. Six or seven cartridges stacked in front of each other in a tube magazine tends to amount to considerable weight. Under recoil bullets that are not crimped in their shells can be driven back into the neck of the cartridge creating dangerous pressure problems, not to mention feeding problems. To crimp the bullets the best tool by far is the Factory Crimp Die by Lee Precision. (http://www.leeprecision.com/ ) This die is collet-type die that can provide the tightest crimp possible without buckling the case walls. I have used it in cases as thin as the .32-20 with great results. For those of you who shoot .44-40 or .38-40 firearms the Lee die is THE DIE to use. The crimp holds the bullet firmly and will not allow the pressure of loading numerous rounds into the magazine - nor the recoil - to drive the bullet back into the case. And you can make a very heavy crimp without buckling the case neck wall just below the bullet. I do not know how the Factory Crimp dies work in other firearms, but in leverguns where bullets must be crimped in the cartridge case this is THE TOOL! During firing tests I rediscovered what long-time users of the .30-30 have known for years. The cases grow longer with each firing. With the long tapered cartridge and gentle neck of the .30-30 this is exaggerated somewhat. It is said the action of the rifle contributes to this also. I found myself trimming the cases every 3 or 4 reloads. I used the RCBS "Case Trim Pro 3-Way Cutter" to trim, chamfer and deburr the cases in one operation. This little tool really speeded up work that I had been previously doing by hand. If you reload the same cases a lot, you will need to inspect them carefully as in time they will weaken near the solid head due to the brass flowing forward. Of course, the higher pressure loads make case growth more of a problem also. For practice and plinking keep the loads on the light side and your cases will last longer. 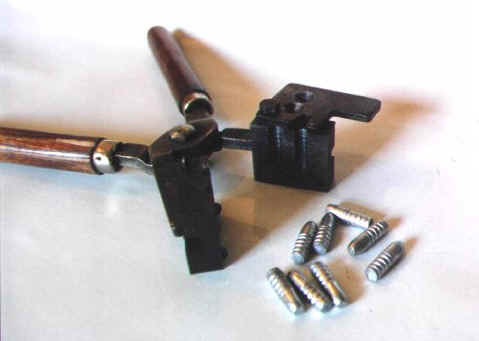 Components for the .30-30 are available from all major suppliers. Winchester, Speer, Sierra, Hornady, Nosler and Barnes all offer plenty of components. Bullet weights run from 110 gr. to 170 gr. in several styles including roundnose, flat-point and hollow-point. I even shot some of the Sierra 180 gr. roundnose that are intended for use in the .30-40 Krag. I did not test them to see if they would "chain-fire" in the magazine. If you decide to use these limit yourself to 2 shots... one in the magazine and one in the chamber. No use taking a chance on wrecking a good gun, let alone wrecking yourself. Barnes even offers bullets for the .30-30 in it's "X-Bullet" - a totally solid copper bullet with and expansion cavity in the nose. These should be tremendous where penetration is required. However, there are some special requirements for reloading the Barnes bullet. 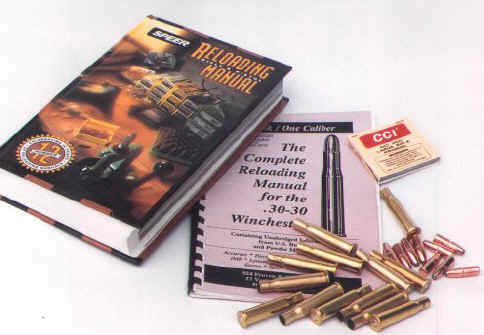 Be sure and consult the Barnes Reloading Manual before you reload with them. In fact, it is a good idea to take careful notice of what the reloading manuals say about reloading a particular caliber before you begin any reloading chore. and no longer available as a reloading component! The variation in data can be confusing until you look at the bullets used, the rifles used, cartridge case type, primers, etc. 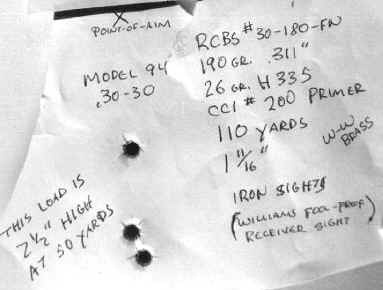 As an example, some of the loads listed above were fired from a Model 94 Winchester, some from a Remington 788 and some from a test barrel, all using different brands and styles of bullets and primers. For my own purposes - and I am not recommending you do this, this is just MY way of doing it - I looked at all the powder charges and discarded the heaviest one. The remaining 7 were averaged, giving me an overall average of 29.6 grains. I reduced that by 3 grains ( 10% of the total) and that gave me the place where I started to work up my loads in the rifle - 26.6 grains of 3031. Coincidentally this just happens to fall near the suggested starting charges in most of the manuals. If you have but one or two manuals to consult I would suggest that you might think about obtaining the "ONE BOOK/ONE CALIBER" reloading manual from MIDWAY (http://www.midwayusa.com/ ) Available in almost all the popular calibers, these books combine the information on that particular caliber from US bullet and powder makers. The One Book/One Caliber manual for the .30-30 Winchester has reloading data from Accurate Arms, Hercules, Hodgdon, Hornady, IMR, Lyman, Nosler, RCBS, Scott, Sierra, Speer and Winchester. This makes it real handy to research loading data for the particular gun and caliber you are going to reload for. Recorded velocities of handloads. All fired from a Model 94 Winchester, 15 feet from the muzzle to the first screen. All loads using CCI Large Rifle Primers. All assembled in WW cases, all bullets crimped with a Lee Factory Crimp Die. Note: These have NOT been tested to see if they are safe to use in the magazine of a lever action rifle. I fired them single-shot, loading one at a time in the chamber. When it came to my first love - cast bullets - the old .30 WCF really shines! The cartridge case is ideal for cast bullet use. As Jim Carmichel in THE ART OF BULLET CASTING said, "....another feature of the .30-30 is the thin, elastic neck walls which allow distortion-free bullet seating without the use of special neck expanding equipment." (page 206) As for powder charges, with cast bullets you can basically use the same data as you would for jacketed bullets of the same weight. This is one of a select few rifles of the smokeless powder era that really likes cast bullets. Before I began shooting cast bullets I decided to clean the barrel and remove all traces of copper fouling. To get it absolutely clean I tried using the Outers electro-chemical cleaner called the "Foul-Out II". While the cleaner worked extremely well for me, let me warn you that you cannot plug this thing in and let it clean your gun while you sit and watch TV. 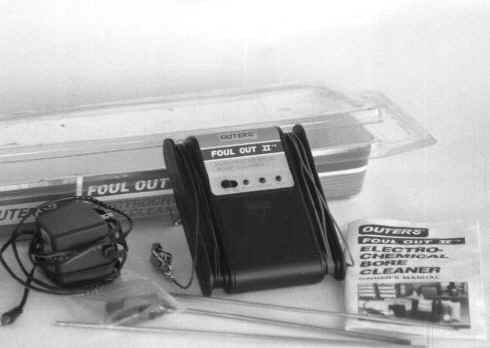 The "Foul-Out II" works as a reverse electro-plating process. The copper that is on the bore is removed and is plated onto a stainless steel rod that is part of the unit. Instructions with the unit must be carefully followed or you can ruin your barrel. First the barrel was thoroughly cleaned and degreased. Since leverguns must be cleaned from the muzzle (unless you take them completely apart), I used a muzzle protector to keep the cleaning rod from wearing any of the rifling or muzzle away. Made from a 7 mm case, it is inserted into the rifle muzzle and the cleaning rod then inserted in through it. Once the barrel was cleaned and degreased I made a stand to hold the rifle upright. plugged the bore with the inserts provided, poured in the chemicals, inserted the rod, hooked up the wires and turned it on. I let it run 10 minutes and then shut it down and pulled the rod out of the barrel. I found that the rod had some copper fouling on it already! Everything looked fine so I re-inserted the rod and let it run for an hour. When I pulled the rod out at the end of the hour I found that the bottom 3 inches of it had turned black. I poured the solution out of the barrel into a clean glass jar and found that it had turned yellow. The instruction book that came with the "Foul-Out II" said this was a sign of rust in the bore. The solution had to be disposed of. If I continued using it the unit would begin to pull steel off of the bore and to plate it onto the rod! The barrel had to be cleaned and degreased again also. And all the copper on the stainless steel rod had to be sanded off. After all that was accomplished I started the process over. After I got it started again I let the unit run for another hour, then pulled the rod out and checked it. There was more copper fouling on it but there were no signs of rust or any other problem. I let it run for 2 hours and then pulled the rod again. This time it was black on the end nearest the chamber. And there was copper fouling on it in various places. I cleaned the barrel and the rod, replaced the solution and started over. At the end of another hour I pulled the rod and found heavy copper fouling. I cleaned the rod and began again. Two hours later I shut it down and pulled the rod from the barrel to find more rust along with some copper fouling. The bore was cleaned and degreased as was the rod. I replaced the solution and started the machine up again. A little over a half hour later the "CLEAN" light came on. I pulled it all apart and found it was indeed clean. After nearly 8 hours of running the electro-chemical cleaner plus the time spent scrubbing and degreasing the bore the barrel was as clean as the day it was made, or nearly so. The rust the unit pulled out seemed to be small pits underneath copper fouling. It has not hurt the accuracy of the rifle as far as I can tell. While it may be a lot of work, it is about the easiest way I know of to get a barrel back close to its pre-fired condition. I did not do a lot of experimenting with different bullets. My goal was a large bullet at moderate velocities as I have said before. I did shoot some of RCBS #32-098-SWC 100 gr. flat-point bullets I use in the .32-20. These were fired mainly to foul the bore. 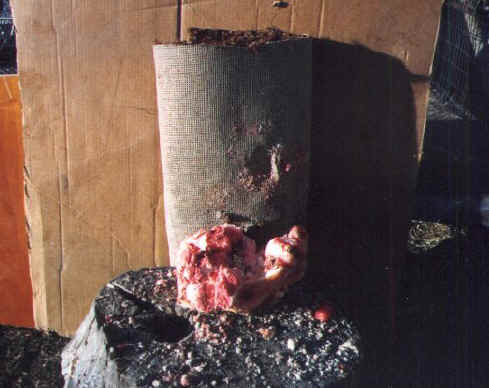 The barrel, after it was cleaned, did not shoot well until over 100 rounds were fired through it.. At first the groups "walked" around the target. The 100 gr. RCBS bullets were fired using 8 gr. of Unique. I also fired some of the Lee 170 gr. roundnose bullets with various powder charges. When the barrel began to settle down I switched to the RCBS #30-180-FN. This bullet casts right at 190 gr. out of my mold when I use wheelweight alloy. I cast the bullets from an extremely hot mold and drop them directly into water from the mold. These water-quenched bullets reach a hardness of 16 to 18 BHN after 24 hours. I use Hornady gas-checks on the bases. The bullets are "sized" in a .311" die. Really, all it does is seat the gas-check and lube the bullet since they drop from the mold at .310". While the barrel is nominally a .308" I found the .310" size to work well. All the old loading books recommend .311" for the .30 caliber rifles. The IDEAL HANDBOOK #34 ( from 1940) says to size cast bullets at .311" for everything from the .30-30 to the .300 Magnum. I did try sizing some to .308" and found no difference in accuracy from the .311" size with the loads I settled on. For the extra work there was no gain. Why do it? All bullets were lubed with Apache Blue bullet lube. Once I found an accurate load I searched no further. My criteria was a load that would shoot the 190 gr. RCBS bullet at over 1500 fps and keep 3 shots under 1" at 50 yards. This is power and accuracy sufficient for anything up through deer, at least in this part of the country. After some testing I settled on 26 gr. of H335. This load gives near 1800 fps and if I do my part will stay under 2" at 100 yards. (see Chart #6) I fired some of these loads on the 200 yard range and found they would take the ram silhouette down easily. Accuracy was good enough for the 150 yard turkey also. I had an old cow that had gotten down and I used this load to end her suffering. I shot her from about 50 feet, angling down into her forehead. The bullet penetrated through the skull, ranged down the neck destroying the spinal column and ended up somewhere in her brisket. I was impressed with the penetration. Since I started using cast bullets my .30-30 has not had a jacketed bullet through it. The cast bullets do everything that I want to do with this gun, at least for now. What more could you want? For my needs anyhow, the Model 94 and the .30 WCF cartridge are a good combination. All loads assembled in WW cases with CCI Large Rifle primers, all with RCBS #30-180-FN cast bullet sized .311" and using Hornady gas checks - all lubed with Apache Blue. All chronographed at 15 feet from the muzzle to the first screen, all groups fired at 50 yards from a rest. group of test fired with this load - 5/16"
The smallest group fired at 110 yards was with 26 gr. H335 = 1 11/16"